Volund Gearworks ATLAS Belt, continued. I have been running a few of the Volund Gearworks ALTAS belts exclusively for several months. Specifically, I have been wearing the 1.5″ Black w/Coyote and Coyote w/Coyote colored belts. These belts have been worn at home, with jeans while I conceal carry and at work as a tactical belt/duty belt. During my time with the ATLAS, I had the opportunity to run the belts on numerous range sessions and at a Combat Focus Shooting course. I have been running several different holsters and magazine pouches on the belts. What sets the ATLAS belt apart from other similar carry belts is the ITW G-Clip. The G-Hook buckle allows for a smooth low profile carry belt. Other similar belts use the Cobra buckle, which is very cumbersome. The ATLAS Belts has stiff scuba webbing sandwiched between two layers of flat webbing. There is also a 1.75″ option if you like a larger width belt. The construction and the stitching on ATLAS belts are top notch. You can order the ATLAS Belt in any color combinations you like on their website (www.volundgearworks.com). The ALTAS belt is very easy to slide on and take off. The design is simple and un-cumbersome. The most attractive thing about the ATLAS belt is the pricing. The ATLAS belt is about half the price of similar belts, and the shipping is currently included in the price. The ALTAS is priced so well, I ordered several for myself and the Loose Rounds Staff. I like having several different color options to go with the clothing and gear I’m wearing. I originally ordered a small 28-34 belt as I wear a 30″ waist pant. This belt fit me with about 1.5″ of leeway left. Once I started to add a holster, mag pouch, cell phone and a knife, I needed a larger belt. 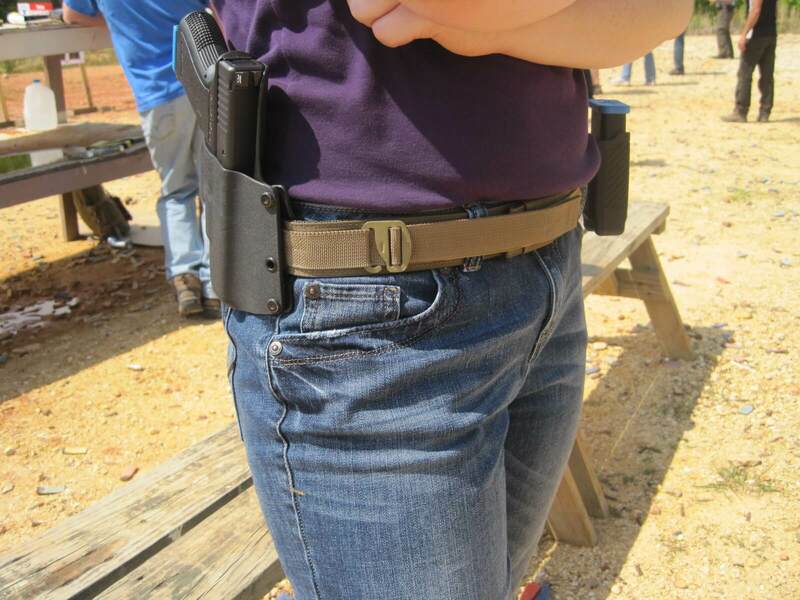 I could not carry inside the waist (IWB) with the small 28-34 belt. Volund was awesome about trading the belt in for a larger size. I then ordered the medium MD 32-38 and this met all of my requirements. Depending on your size and what you are going to use with the belt, choose a size a little larger than your pant size. As I stated before, I have been running the ATLAS belts for several months. The ATLAS belt is one of the most comfortable belts I have ever worn. Wearing the belt all day and night, I never really notice it. It is very comfortable. The ALTAS belts seems to have the right combination of stiffness and flexibility for long periods of carry use. The ATLAS belt provides a very stable platform for drawing your firearm. 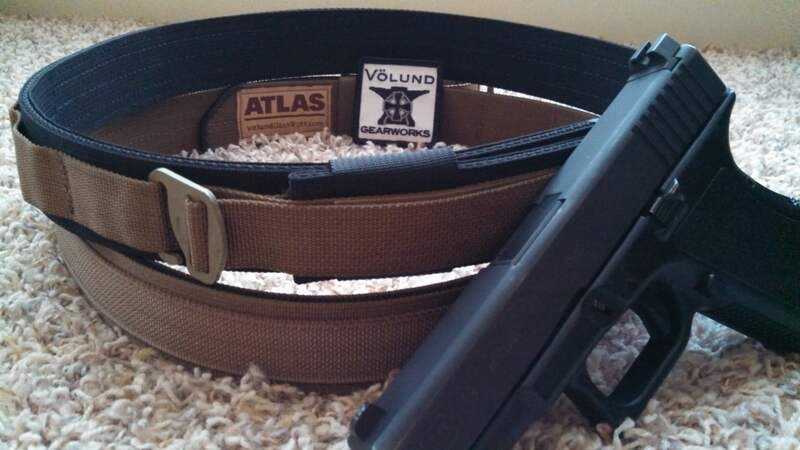 The ATLAS belt performs equally well as a conceal carry belt, range/firearms course belt or everyday belt. 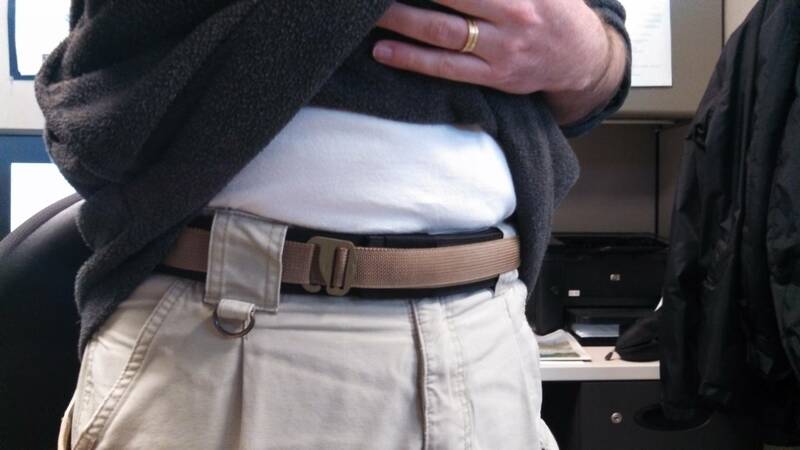 My main reason for purchasing the ALTAS belt, was as a conceal carry belt. I had been considering other belts when the owner of Dark Star Gear, (www.darkstargear.com), pointed us in the direction of Volund Gearworks. Knowing how well the Dark Star Gear products preformed, I knew the Volund ATLAS belt needed some serious consideration. As a conceal carry belt it has surpassed my expectations. Many times I have forgotten I was even carrying with this belt, it is that comfortable. 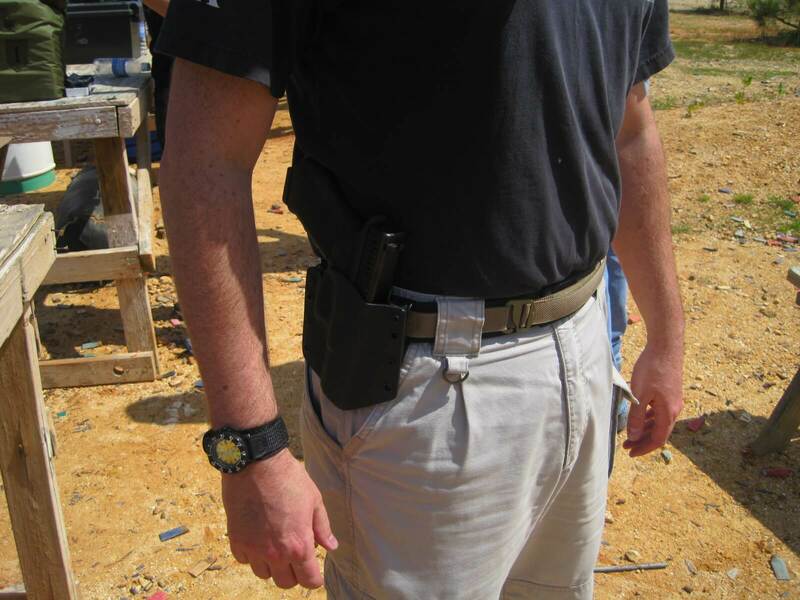 I found myself wearing the belt even when I was not carrying a firearm because it was so comfortable. A conceal carry belt needs to hold your holster firmly and allow you to draw your firearm, without the belt slipping or moving around. The ALTAS provides a secure and stable platform for conceal carry. 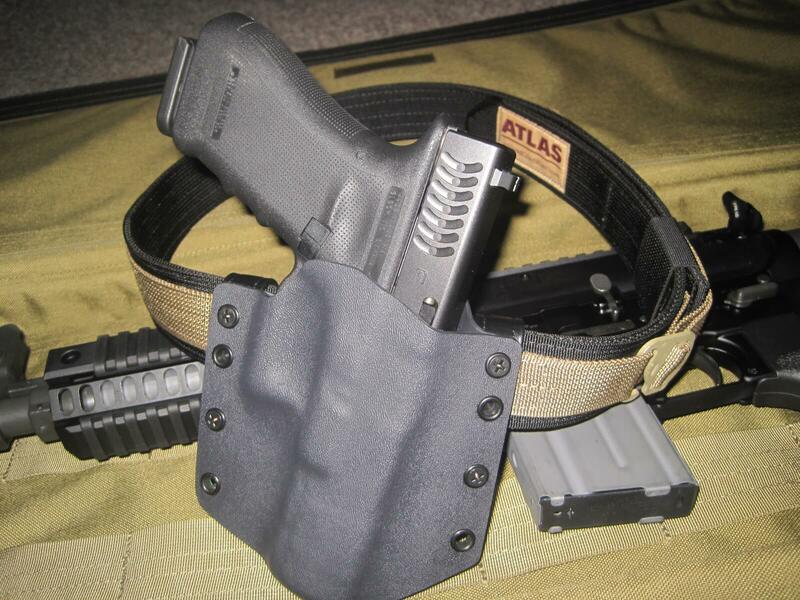 The ATLAS belt is also stiff enough, to keep your holster secure along your body. The weight of a full size firearm will not flex the ATLAS belt away from your body. This rigidity allows you to have a smooth low profile and cuts down on printing of your concealed firearm. I have also been wearing the ATLAS belts to work as a light weight tactical belt. I normally wear 5.11 pants to work and find the ATLAS belt to look and function very nicely with this set up. In fact, I found I liked the ATLAS so much at work that I have been recommending the belt to coworkers, some have purchased it already and others are planning to. I have done some plain clothes/undercover work in my career. Having worn the ALTAS with tac-pants, jeans and slacks while conceal carrying, I feel this would be an excellent choice for UC work. The ATLAS gives you the right amount of security and flexibility for this kind of work. The 1.5″ ATLAS has been doing very well at work but if I was going to be carrying multiple tools, pouches and other gear, I would suggest the 1.75″ ATLAS belt. Especially, if you are stepping into more of a modified patrol officer or Tac unit roll, the 1.75 ATLAS would allow you to carry more weighted gear. From what I understand, Volund Gearworks can also make the ATLAS as an underbelt, with hook or loop for 2.75″ and 3″ traditional duty belts or war belts. With the low profile of the ITW G-Hook, I feel this would be a winning combination. 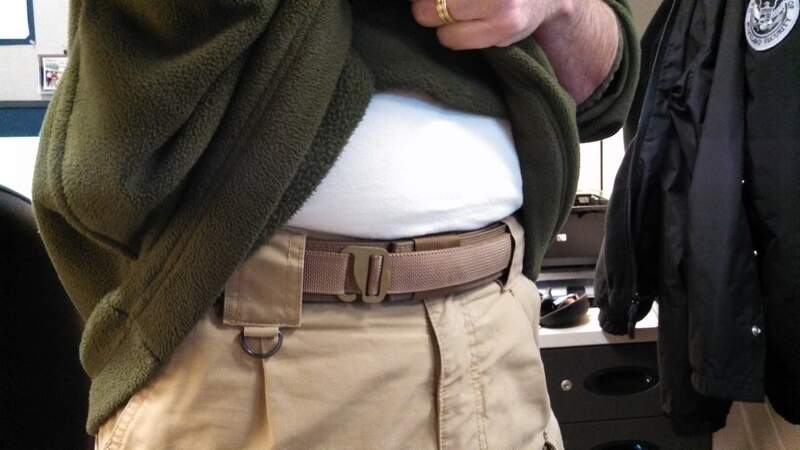 As I stated with conceal carry, The ATLAS belt is very comfortable. As it stands right now, the ATLAS is going to stay my work/duty belt. I recently took two (2) of the ATLAS belts to an I.C.E training, Combat Focus Shooting (CFS) course, Instructed by Rob Pincus. I ran an ALTAS belt and my wife ran another ATLAS belt in the course . (Cassie will be doing a review of the ATLAS belt for women, as she really liked the ATLAS). During some discussion time in the class, I had conversations about the G-Clip over the Cobra buckles on similar belts. The consensus was, the G-Hook offered substantially less printing than a Cobra buckle due to its low profile. During the CFS course and other ranges sessions with the ATLAS belts, the belts performed above my expectations. Throughout rigorous days of constantly drawing, holstering and dynamic movements, the belt never moved. I realized later, I never had to adjust the ATLAS or my gear on the ATLAS belts. With a lot of the other belts I have used over the years, I find myself constantly adjusting the belt, pulling up my pants or adjusting the gear on the belt. With the ATLAS, it just never came up. I really like the Volund Gearworks ATLAS belt. It will be my go to belt from this point on. Now, are there other belts out there that are as good and work like the ATLAS, of course. But, for the price the ATLAS belt is really hard to beat. The G-Hook is also one of the shinning features of the ALTAS belt. It is low profile and this is what you want in a conceal carry belt. The ALTAS is truly versatile for every day carry, concealed carry, plain clothes/undercover carry, duty/off duty carry or a serious range/competition belt. In the near future I will be purchasing more Volund Gearworks ATLAS belts. One handed Saiga 12 use.